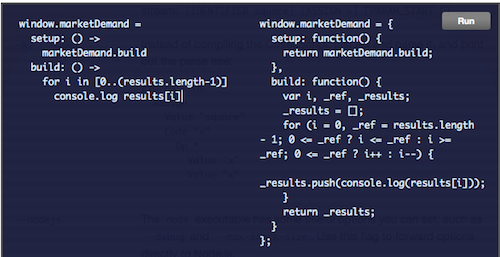 If you're a Rails developer, CoffeeScript is something you need to pay attention to. With the news that CoffeeScript will be included by default in Rails 3.1, CoffeeScript is definitely generating a sizable amount of momentum and the core Rails team believes it's the future. Knowing this, I was looking for an opportunity to use it and a clean project presented itself this sprint at thredUP. So with the help of my colleagues Kylie and Chris, we dove in and started playing away. The first step is to install CoffeeScript (really?). I used CoffeeScript's official installation instructions, but I ran into some weird export PATH environment issues so I installed it with Homebrew instead. You're almost there. Just two more install commands left. The first is installing Node Package Manager and the second is using NPM to install CoffeeScript. You can end your CS files with .coffee or .js.coffee, so create a new file in there so we can finally write some code. The project I'll be using as my example is heavily focused with DOM manipulation and since thredUP's library of choice for that is jQuery, you'll be seeing a lot of that in here. That command will watch a specific CS file and when it detects a change, it will automatically re-compile it for you. Pretty killer, right? This post became a lot longer than I originally intended so I broke it into two posts and I'll post the second one in a couple of days. In the next post I'll be going through using jQuery in CoffeeScript and covering if/else statements and other standard snippets of JS -> CS that you might find handy.